When I was learning banjo as a kid, the prevailing wisdom in all the banjo books was, “Both the ring finger and pinky of a player’s picking hand need to be planted on the head of the banjo at all times when when playing.” Indeed, this was how my own banjo teacher taught me to play. Of course, I never questioned this logic for one minute. And why would I? This was, after all, the way Earl Scruggs played. One only need look at the cover of his book, “Earl Scruggs and the 5-String Banjo” to see where he stood on the issue. If it was good enough for the father of the 5-string, there was no need to question it – that was obviously the “correct” way to play the banjo. It wasn’t until I began going to bluegrass festivals and seeing pros play that I noticed there were more than a few pickers out there who seemed to openly flout this rule. Why were these guys playing with just their pinky on the banjo head? Hadn’t they read any of the banjo books? Didn’t they have a teacher who could show them the error of their ways? Around this time I began studying banjo with the legendary Pat Cloud and noticed that even he ignored the two-fingered anchor approach. Had the world turned upside down?? Despite everything you may have read in books, seen online or heard from other players, there really isn’t a “correct” way to anchor your picking hand. Sure, there are pickers on both sides of the issue who will defend their positions to their graves. Some players in the “one-finger” camp, for instance, assert that planting the ring finger limits the mobility of the middle finger (a claim I do not support, incidentally). 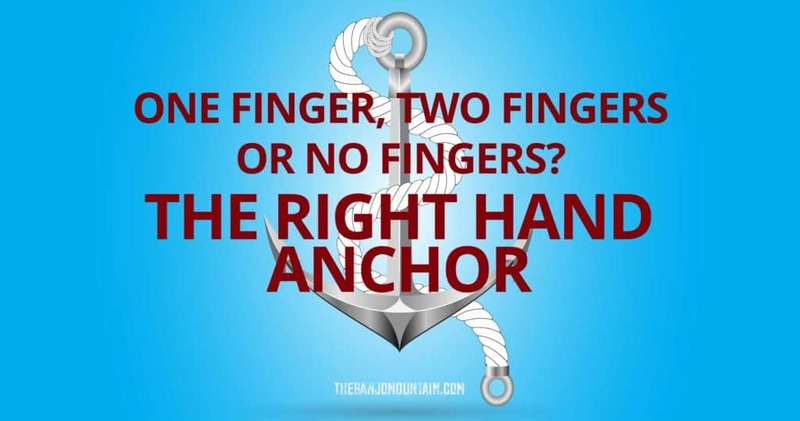 Regardless of which approach you choose, what matters most is that you simply anchor your picking hand. Of course you’ll occasionally come across pickers who don’t anchor their picking hand at all (Bill Knopf is one example), but this “no anchor” approach is not one I recommend. Our picking hand needs to have a solid base to give it stability so that our rolls are even and smooth. My recommendation to any new banjo player would be to try both approaches and see which one you are most comfortable with. Start with both the pinky and ring finger planted. Now play some basic rolls for five to ten minutes. What seems to be happening? Does your ring finger want to move every time your middle finger picks a string? Is it painful or uncomfortable to keep your ring finger down on the banjo head? If you’re among those people whose pinkies are substantially shorter than your ring finger, you might find that keeping your ring finger planted and your pinky up feels more natural than ring finger up/pinky planted or both fingers planted. The idea here is to experiment with the different approaches, decide which one works best for YOU and and then stick with it! CLAWHAMMER BANJO VS. BLUEGRASS BANJO: WHICH STYLE SHOULD YOU LEARN?